I mowed my first lawn in 1975 and hated it. As a kid, the work struck me as loud, boring and bad for the environment. But I’ve developed an appreciation for the look of fresh-cut grass. Nowadays I like it a lot. The trick is getting that well-groomed appearance without spending a lot of time at the job. So back in 2006, in my quest for a better way to mow, I replaced our conventional lawn tractor with a grass cutting machine first invented in 1956 by a young and lazy man named Max Swisher. He created the world’s first zero-turn radius mower, and it’s not too much to say that the Swisher machine I bought 12 years ago and still use has revolutionized the way we take care of our lawn. And to tell you the truth, the machine is actually fun to use and amazingly long lived. As a young man Max Swisher didn’t like cutting grass, and he brought his considerable mechanical skill to bear on the job of minimizing this work. He invented the world’s first self-propelled lawn mower in 1945, tying it to a tree in the middle of his yard. It traveled in ever shrinking circles as the rope wrapped around the tree trunk, cutting the lawn automatically. Swisher went on to create the world’s first zero-radius mower. Steering is accomplished by causing the rear wheels to rotate independently of each other, one side more and the other less to negotiate a turn. You can stop one wheel entirely to turn on a dime. Current models work significantly faster than conventional lawn tractors for a couple of reasons, earning the zero-radius mower concept a place in the Popular Mechanics list of 100 top inventions of the 20th century. The genius behind Swisher’s concept reminds me of the way a grocery store shopping cart steers. The model I chose back in 2006 cuts a 60-inch wide swath, but that’s only part of the reason it covers so much ground in so little time. A honking-big mower deck is worse than useless if it means you can’t work in and around trees and bushes. This is why maneuverability is key, and it’s where the zero-radius turning feature shines. Unlike regular lawn tractors that steer as you turn the front wheels, a zero-turn radius mower doesn’t offer any control of the front wheels at all. They simply swivel freely, just as they do on a shopping cart. As I said, you steer by controlling the relative rotational speed of the rear wheels. Instead of a steering wheel, you have two levers up at hand level, independently controlling the speed and direction of each rear wheel. Push both levers forward, and the machine moves forward. Push one lever more than the other and you turn gently. Pull one lever back while you push the other forward and the machine pivots around a single point as the wheels spin in opposite directions. Turning on a dime is what “zero-turn radius” is about, and it makes all the difference. 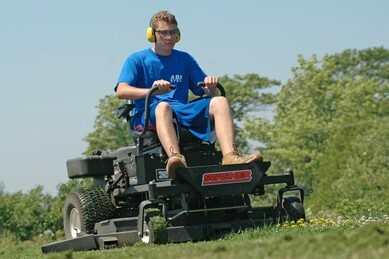 Our Swisher mower has reduced grass cutting time by 70% and cut fuel usage in half. Dozens of other machinery companies have copied Max Swisher’s zero-turn concept to the point where it’s now a generic feature of the lawn care industry, but most other brands are very high priced. Swisher’s corporate philosophy is to deliver good quality at reasonable prices, and after 12 years of using the ZT2560 model I bought, I can say they’ve accomplished this. In addition to the fact that my mower cost roughly half as much as other zero-turn machines when I bought it, parts are inexpensive and easy to find. The main drive belt running the blades, for instance, is a standard rubber vee-belt available almost everywhere. Nothing fancy. 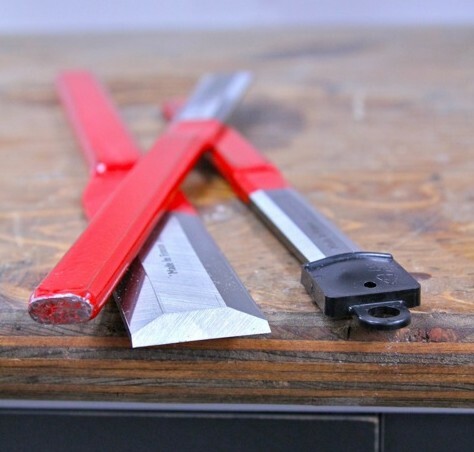 Replacement blades are generic and inexpensive, too. To be fair, I have had to do repairs on my Swisher over the years. One of the three main bearings on the mower deck needed to be changed, the bolts holding one of the hydraulic motors powering a rear wheel sheared off, the wire connection leading to the hour meter needed to be pushed back on, and I had a throttle cable break. 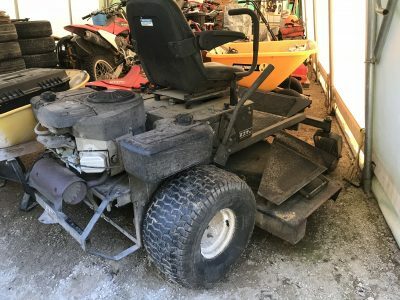 I’ve always done all repairs myself and find the mower as easy to work on as it could be. Parts are easy to get and arrive quickly. Assuming the mower cuts about an acre an hour, we’ve probably mowed nearly 500 acres of grass since 2006 and the 25 HP V-twin Briggs and Stratton commercial engine fires up and works perfectly every time. Regular oil and filter changes are a big part of this longevity, but still, it’s just a good engine. Some concepts change everything. If you’ve got more than a little grass to cut, zero-turn radius equipment makes the job a whole lot shorter, and possibly even more fun. At least if the eagerness of my teenagers to mow the lawn is any indication, that is. And for what it’s worth, I’d buy another Swisher zero-radius mower again.